Beautiful, brand new floors don’t have to be fragile and delicate. GTA Flooring offers you a tougher, more durable option with our luxury vinyl flooring in Vaughan, ON, Canada. 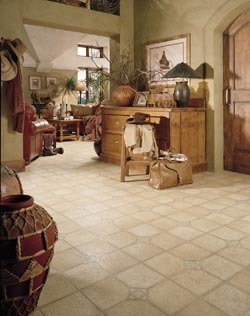 This type of floor offers some of the best in both design aesthetic and versatility in setting. In places where other floors won’t hold up under moisture, luxury vinyl is the way to go. We carry it in both tile and plank form to please every preference. Recent advances have made luxury plank flooring much more comfortable to walk on than it used to be. New fiberglass backing and other techniques have helped to create a cushy feeling for those who are on their feet all day. We’re proud to carry samples from industry leader Downs, which offers scrape and scuff-resistant floors for the most active of homeowners and families. Browse our collections of LVT and find many choices of color and pattern that are comparable to those of our tile flooring. We’re more than happy to help you find the perfect match for your home. The benefits are similar as well, given that luxury vinyl tile offers a high level of durability under water and heavy foot traffic in addition to easy maintenance. Children, pets, and parents alike love our floors because of how easy they are to clean and keep looking nice. No one wants to spend family gatherings worrying about a clean floor, and our products ensure that’s never necessary. Even more accommodating than its performance is its appearance. Our luxury vinyl floors can be made to resemble stone, tile, rich hardwood flooring (P3), and more. You get the high-end floors without the expense or maintenance. There’s no need to be concerned about warping or expanding if there’s too much moisture or the temperature changes. There’s a reason why this material is considered resilient flooring. No matter how many guests are walking on it or how many accidents your pets have, you can still enjoy a nice, new-looking floor. Children and pets love to play on it, and parents love the easy maintenance. Just the simple routine steps like sweeping, cleaning, and vacuuming are all you need to do. Vinyl tile is also great for safety, because it reduces slips and falls and meets most flammability requirements. After you’ve bought your luxury floor, you can enjoy it right away by allowing us to do the installation. Our crew takes careful measurements so you never have to worry about buying too much material or not enough, and we complete the job quickly and carefully. Once the luxury vinyl flooring installation is complete, your whole family is likely to both walk easier and breathe easier. This type of flooring gives off low volatile organic compounds and is made of recycled material, giving your home cleaner and better-quality air. If one tile should ever break, it’s easy to fix without having to replace the entire floor. This saves you tons of money in years to come. Contact us to learn more about our various forms of luxury flooring. Our doors are open to clients from Vaughan, Mississauga, and Oakville, ON, Canada, and neighboring communities.